The Chief Executive of the Nursing and Midwifery Council (NMC), Jackie Smith, announced in May she will be stepping down from the end of July. The move came in advance of the publication the same week of a damning report by the Professional Standards Authority about the NMC’s handling of cases from the Morecambe Bay scandal. It is a time of huge change for the NMC, with two important consultations about to finish. 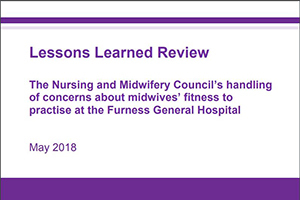 The NMC’s consultation on proposed changes to its fitness to practice procedures closes on June 8th. It proposes shifting most responsibility for investigating concerns about nurses and midwives to the employers, and drastically reducing the number of cases that proceed to a formal hearing by dealing with them through a process called ‘consensual disposal’. AvMA has concerns that employers will not always be the best people to investigate concerns about nurses or midwives, and that ‘consensual disposal’ of cases might involve ‘plea bargaining’ behind closed doors. Whilst not opposed to avoiding unnecessary hearings, AvMA is calling for guarantees about the transparency of the process, so that it ca be seen that a nurse or midwife simply accept the allegations and appropriate sanction, or proceed to a hearing. The NMC is also consulting on how it will regulate Nursing Associates. This consultation closes on July 2nd.